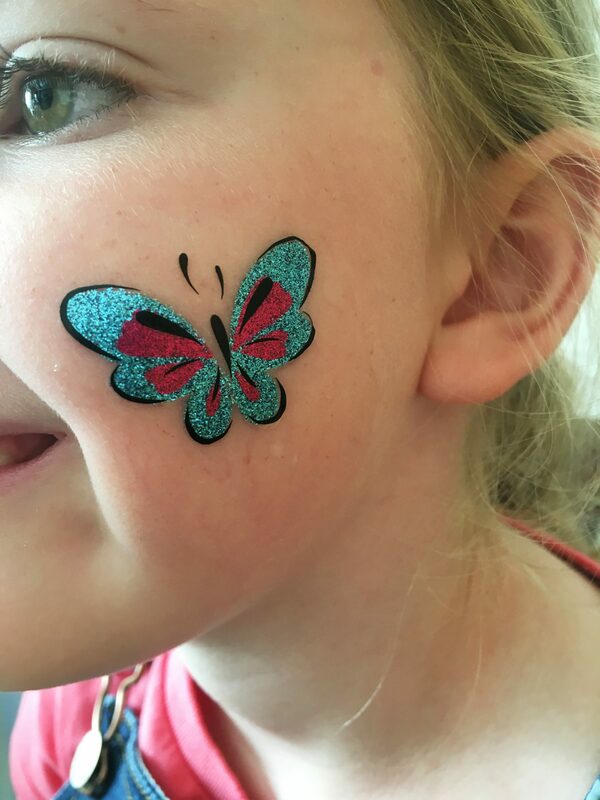 My daughter absolutely loves having her face painted, tattoos and glitter tattoos. All of which she has had done at birthday parties. I am fairly good at face painting, my repertoire is however limited. There is only so many times my seven-year old wishes to be painted as a tiger, my speciality! When we were introduced to FabLab festival face tattoos I knew I wouldn’t be panting many tigers again. These wonderful tattoos are the coolest face tattoos I have ever seen. They are so easy to use and you get everything in the box that you need. 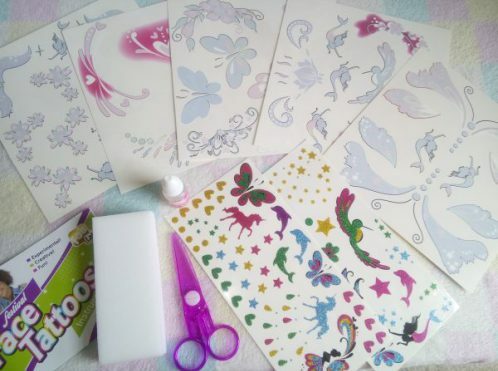 Included in the box are 5 sheets of colour tattoos, 2 sheets of glitter tattoos, Tattoos remover (Baby oil), Scissors, Applicator Sponge and the instructions. All you need to supply is the water. You can combine the tattoos in what ever you way you want, meaning that you have your own unique look. 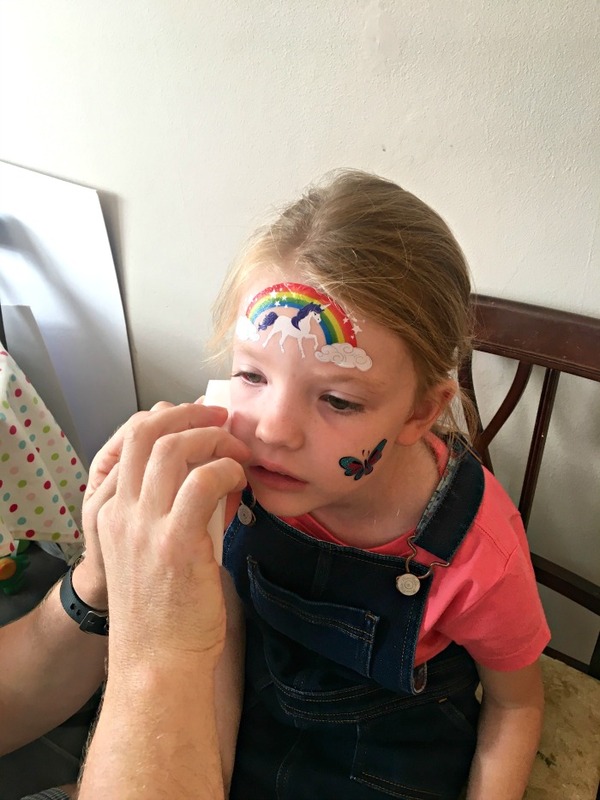 E decided she wanted a unicorn on her forehead and then some glittery tattoos on her cheeks. I don’t have that many photos of applying them due to technical issues. There is however a video at the bottom that shows you how they are applied and how they look. When E chose the tattoo she wanted, I cut round the tattoo as it explains in the instructions. We then removed the clear protective sheet and placed the tattoo onto her face. Holding the tattoo in place we got the applicator sponge and dipped it into some water. Making sure it didn’t get too wet. We then patted over the tattoo with a damp sponge for around twenty seconds. After which we removed the sheet and in its place was a stunning face tattoo. The unicorn looked brilliant and the glitter festival face tattoos looked stunning.. I have never seen face tattoos that look so good. Every temporary tattoo I have come across look a bit rubbish and crack and peel of really quickly. The FabLab festival face tattoos are nothing like that at all. We had to use the baby oil to remove them and one even lasted over night. E was adamant that she was keeping the small glitter tattoos on her face! The FabLab festival face tattoos are so simple to use and look amazing. I can’t believe I haven’t seen these before. They are a firm favourite in this house and as they are so quick to use I don’t mind when E asks for a face tattoo. 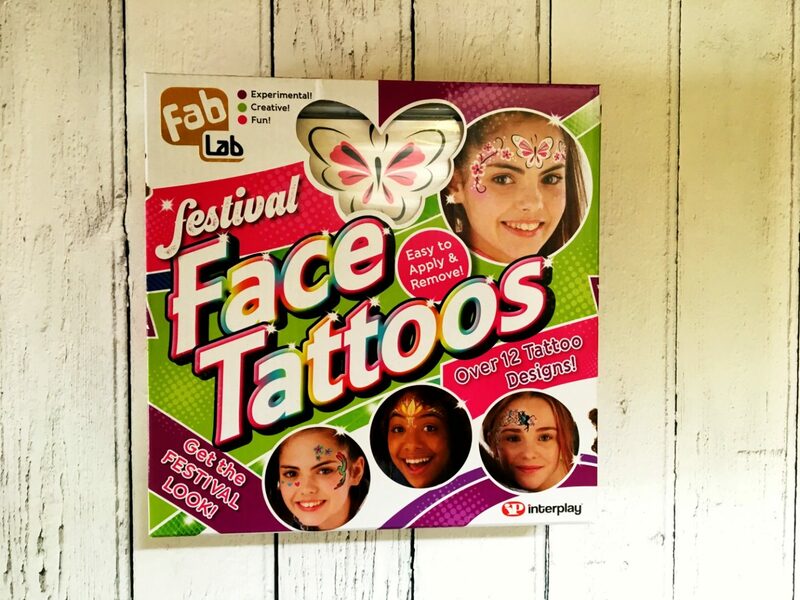 You can purchase the FabLab Festival face tattoos set on the Interplay website and other good retailers. 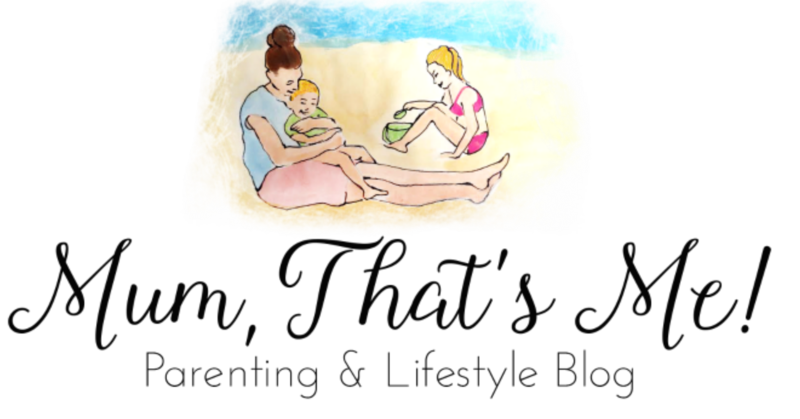 Take a look at our video to see how simple it is to apply these wonderful tattoos. 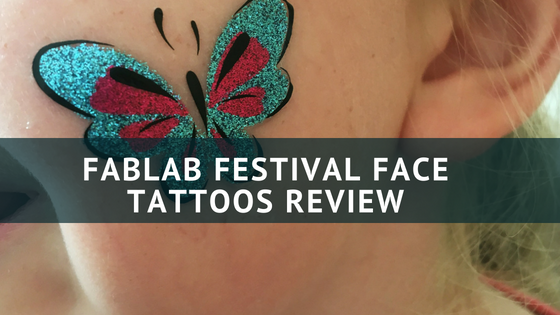 Disclaimer – We were sent a box of FabLab Festival Face Tattoos for the purpose of this review. All opinions are our own.